But despite my strong background in finance, I still felt incredibly intimidated the first time I met with a financial advisor who was not my father. No matter how much you may already know before you set foot in an advisor's office, you will still probably encounter unfamiliar financial jargon and advice whose soundness you feel like you have no way of judging. The best way to arm yourself against bad (or even just inappropriate) financial advice is to ask lots of questions. Trusting an advisor with your finances is no time to pretend you have knowledge that you don't. 1. "You can assume an X% return on your investment." You may recall the brouhaha over financial guru Dave Ramsey's claim that investors can expect a 12% return on their investment over time. While many have (rightly) criticized the math (or lack thereof) that Ramsey uses to make such a claim, the bigger problem with this kind of advice is the fact that it's making assumptions that no one can guarantee. As every financial advisor worth his salt will tell you, past performance does not guarantee future results. The advisor you want to work with will give you several projections for your investment, based on different potential rates of return. At no point should you ever hear your advisor tell you to expect a certain rate of return, because unless he's also running the world's most accurate fortune telling business, there is no way he could know. 2. "Don't worry about the cost of this product! You pay nothing." 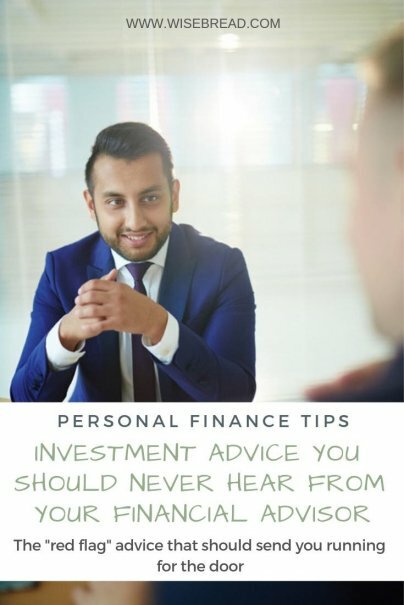 One of the reasons why new investors can be intimidated by the process of finding an advisor is because of the many different types of professionals who may all legally call themselves a financial planner or advisor. On one end of the spectrum, you have registered investment advisors, who have a fiduciary duty to give you ongoing advice that is in your best interests — and on the other, you have insurance salesmen who are paid by commission and are therefore very motivated to sell you products. 3. "I can customize a stock portfolio for you." There are two major problems with this piece of advice. Basically, stock picking is not an exact science, and even the people who do it (and nothing else) for a living are wrong about half the time. If your advisor tells you she can do this for you, then prepare for disappointment. The other major issue with this advice is the customization aspect of it. Does the advisor provide such a level of service to all her clients, or only to the big rollers? If customization is only available for certain investors, that brings up a big ethical problem: Why doesn't your financial planner want to help all her clients equally? And if your advisor claims to do this for every client, how could she afford to stay in business considering the amount of time she'd have to devote to each one? You should instead be looking for an advisor who will customize your asset allocation strategy and help you determine the best investments within that strategy. 4. "There is no risk!" or "You really need to act now." I put both of these together, because both pieces of "advice" are hallmarks of a hard sell, rather than legitimate advice you could expect to hear from a financial advisor. Similarly, having an advisor tell you that you absolutely must jump on something now is a good indication that you're dealing with a salesperson rather than an investment advisor. There is no investment that cannot wait for you to take the time to weigh your options. Putting an artificial deadline on a product is one of the oldest sales tricks in the book, and it is not ever something you want to hear from an advisor. When you come right down to it, if your advisor utters a phrase you most recently heard on a late-night infomercial, then it's time to find a new advisor. The reason why "advisors" like Bernie Madoff were able to scam so many people for so many years is because most of us simply do not like to think about our finances. We would all like to find someone else who can do the worrying for us — and if they promise that we can see impossible returns, all the better. But the truth is that no one can care about your finances as much as you do. So even when you do find a financial advisor whom you trust, you still need to look at your relationship as a partnership, rather than an opportunity to forget about your finances. Making sure you understand exactly what you're getting into with an advisor is the first step in remaining in control of your finances and your life. What's the best "worst financial advice" you've ever received? I especially agree with #4. There are just no guarantees or one size fits all solutions! Asking questions is one way to learn stuff; it also tells you a couple of things about the advisor. Is he/she answering your questions properly? Or just brushing them aside impatiently? Does he/she give dodgy replies? The attitude of the financial advisor matters too, imo.